the following article is not Anti-Iranian (people). Far from it. Neither the Prophet (peace be upon him) nor his companions were Anti-Persian, how could they be Anti-Any race if Islam prohibits nationalism. As a matter of fact, the Prophet had more than one Persian companion and along with them *fought* the most noble (based on lineage) Arabs such as the evil uncle of the Prophet, Abu Lahab. This very Prophet (peace be upon him) had singled out the Persian lands (he did so with very few lands, such as Syria, Yemen etc.) and early (Sunni) Persian Muslims, testifying that they are a people of great merits (Imam Muslim, from Persia, Nishabur himself put an ENTIRE chapter in his Sahih titled “the VIRTUES of the PEOPLE of Persia”). And whoever visits our blog can check out for himself how many of the greatest Sunni scholars ever were of Persian backround and how many Arab scholars praised them with the best of praise. However, one group among the Persians was always known for their wretchness, evil and hatred for Islam. Every since the defeat of the Majoosi (Zoroastrian) Persians at Al-Qadisiyyah this group amongst the Persians tried its utmost to either destroy Islam completely or at least to corrupt it as much as they can (having their own Iranian Islam). Islam reached Persia in the early stages of Islam and over 900 years most Persias were staunch and proud Sunni Muslims, even today there is a large Sunni minority in Iran, but history recorded how the Safavids butchered or forced most Persian Sunnis to Shiism, ever since then (around 400 years ago) Iran is a majority Shia country. So around 400 years ago, the minority of Zanadiqah (heretics) among the Persians who were nationalists and Zoroastrians (with the help of the Turkish but Persianised Safavid clan) for the first time of Persia’s Islamic history could get rid of most Sunnis of Iran and spread their polytheistic Twelver religion in almost every corner of Iran. Today these heretics rule under the dictatorship of Wilayat Al-Faqih, aiming high, dreaming of the revival of a Persian Majoosi empire (under the pretext of spreading the school of thought of the Prophet’s Household). On the 3rd of January 2016 (just a few weeks after the farce that Iran annualy organises and calls “Sunni-Shia unity conference) , a day or so after the backwarded Basij under the eyes of the authorities burned down (!) the embassy of Saudi Arabia (after Saudi Arabia executed over 40 Sunni extremists and only three Shias, one of them the extremist Baqir Nimr Al-Nimr) Bahrain and Sudan have expelled all Iranian diplomates. The Mullahs in Iran (who are amongst the top when it comes to executions, including poets, political dissidents and hundreds of Sunnis) went all crazy and started threatening Saudi Arabia from their pulpits and military bases (Revolutionary Guards). A few years ago Iran plotted (based on Khomeini’s 50 years plan to export his revolution and to take over Arabia) and tried to create a WTF (Wilayat Al-Faqih) state with his stooges in Bahrain who caused nothing but havoc in the name of freedom. 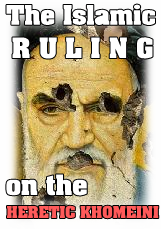 This dream of Iran was shattered, or lets say that the Mullahs ribs were broken this time. Then their ribs were (or are still) broken in Yemen (Houthis) were Iran tried to install one of his puppets and proxy as the leader of Yemen, Abdul-Malik Al-Houthi was about to become the Yemeni Nasrallat, but, well, it didn’t work out, ribs got broken …. A few weeks ago the Mullahs other ribs were broken in Nigeria were a obedient stooge, Ex-Sufi, now Rafidi Shiite Mullah Zakzaky, was dragged from his stronghold like a dog, after his followers attacked the Nigerian army (and in any case, are openly armed and swear loyalty to foreign powers such as Iran in plenty of their videos, in a sovereign country and Sunni part of Nigeria!). This entry was posted in Miscellaneous, N E W S, The Neo-Safavid State. Bookmark the permalink.